This excellent post from Nerdalicious, whose tabs appropriately include “History of Folk and Fairy Tales”, sh ows just how desperately ridiculous the Cairo case really is, particularly when they treat More’s first half as a Fifth Gospel and ignore his second. After all, we have already shown that the small coffins buried with Edward IV are irrelevant, that several different discoveries were made during the seventeenth century, that Charles II benefited from the find in 1674 and that the “Princes” mtDNA could well be available soon. Elizabeth of York and the cult of Edward of Lancaster…. 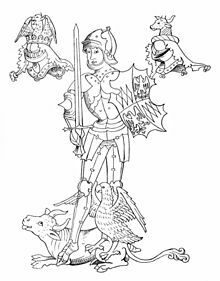 Edward, Prince of Wales, the eighteen-year-old son of Henry VI and Margaret of Anjou, was killed in the Battle of Tewkesbury, 4th May 1471. He became the subject of an exclusive posthumous cult. The chronicle of Tewkesbury Abbey tells of the Prince’s death in battle and of his burial ‘in the mydste of the covent quiere in the monastery ther’; the short paragraph describing his death ends with the words ‘for whom god worketh’, a reference to miracles performed at the tomb, which is now lost. The plaque in the floor of the abbey merely marks that he rests somewhere close by. A little like the tomb of Queen Anne Neville in Westminster abbey. The quire is in the western part of the chancel, between the nave and the sanctuary, which houses the altar and tabernacle. In 1911, flowers were still being laid on the site of the grave. At the crossing is the Quire (or Choir) and the screen, as well as the north and south Transepts. The Tower sits above the crossing. Further evidence of interest in the Prince includes an annual commemoration, bequests at his tomb, and pilgrimage to it. Queen Elizabeth of York offered, in March 1502. ‘to Prince Edward 5s’, though it was not indicated where exactly she offered them. There was a cult of the prince’s father, the saintly Henry VI, and Elizabeth offered three times at his shrine in Windsor. Henry VII must have granted his permission for these offerings. 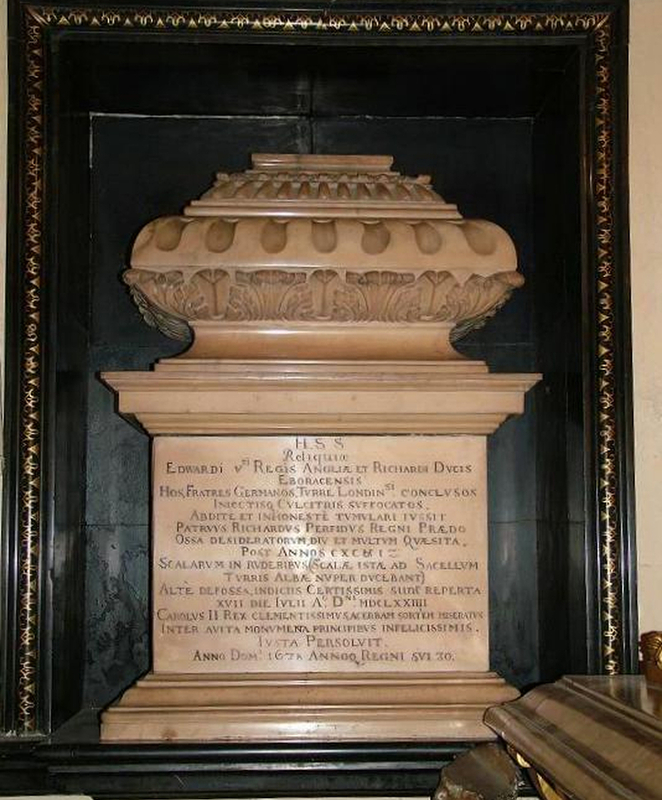 In 1508 Edward, Duke of Buckingham (died 1521) visited the prince’s tomb in Tewkesbury. Danna Piroyansky, author of Martyrs in the Making – Political Martyrdom in Late Medieval England, considers he may have been hoping to advertise his Lancastrian connections, which made him a potential claimant to the throne, but I cannot go along with that. Advertise his closeness to the throne when Henry VII and then Henry VIII were reigning? It would amount to something close to a death wish. To return to Prince Edward. He is believed to have fallen in battle, and the story of him being caught fleeing could be a Yorkist attempt to ridicule the Lancastrian heir’s courage, and thus contrast him unfavourably with the ‘courageous and manly’ Edward IV. It has to be considered. As does the other story that he was murdered by Richard of Gloucester to clear the way to marriage with Anne Neville, whose husband the prince was. This latter tale strikes me as another calculated Tudor fib to blacken Richard’s name. I digress. After the battle, Edward IV attempted to check the much more important cult that swiftly arose around Henry VI, but there is no evidence that he did the same in the case of Prince Edward. Maybe because it was a number of years after Tewkesbury—1502—when his cult began to develop. And 1502 is when we have Elizabeth of York offering 5s ‘to Prince Edward’. Now, there was more than one Prince Edward, Prince of Wales, of course. Another was the elder of Elizabeth’s two brothers, who was briefly King Edward V, and had been famously ensconced in the Tower with his younger brother. No one knows what happened to the boys, and everyone likes to blame Richard III. Failing that, they blame the Duke of Buckingham, Margaret Beaufort and Henry VII. The disappearance of Edward IV’s sons might have suited a number of people. There is a question mark over the claimant Perkin Warbeck, who led Henry such a merry dance. Many believe he really was who he said he was, the younger boy from the Tower, Richard, Duke of York. If that is true, then what happened to the older of the boys, the lost King Edward V? If the little Duke of York had survived to manhood, why would he, not his elder brother, come back to haunt Henry VII? Maybe because Edward V—Prince Edward—died of natural causes? If so, where might King/Prince Edward be buried? Presuming he died in England, of course. Perhaps a suitably secret place was one that was really quite obvious – the tomb of another Prince Edward. Elizabeth of York’s uncle and aunt, George, Duke of Clarence, and Isabel Neville, his duchess, were already buried in Tewkesbury Abbey, so the abbey may have seemed a good idea because of them as well. Above is Clarence House, Tewkesbury. Might it have once had something to do with George of Clarence? He was granted Tewkesbury, had a bridge built there, and was buried in the abbey, so it is clear he had a lot to do with the town. This might have been his residence. Would Elizabeth of York have to go to Tewkesbury in person to offer? Or could she send someone? There is no record (as far as I know) of her visiting Tewkesbury, so I think she would have delegated. Thus she could honour her lost brother right under her husband’s nose, in the guise of commemorating Edward of Lancaster. Too far-fetched? Well, I am a novelist, but I do not see this as being so far-fetched as to be impossible. I have no doubt that those of you who think it is wildly unlikely will soon tell me so! PS: A third Prince Edward, another Prince of Wales, was Richard III’s little son, about whose death and whereabouts there is still such a mystery. I will not pamper the novelist in me by wondering if Tewkesbury might be his resting place as well. With his uncle, George, Duke of Clarence. A temporary interment, while Richard prepared a much grander tomb for himself, his queen and his son. But then Bosworth put a stop to any plan poor widowed Richard may have had. Enigmatic signs and messages in a portrait of Richard III…. Everyone knows about Leslau and his theories concerning the Hans Holbein portrait of Sir Thomas More and his family. In Leslau’s opinion, the portrait reveals much about the fates of the “Princes in the Tower”. Another Holbein painting, “The Ambassadors” is also filled with secret messages. Or so it is said. I cannot argue one way or another, because I do not know. Now it seems there are similar mysteries to be solved in the National Portrait Gallery of Richard III. The hands/rings are crafted to expose cryptic clues and give answers concerning his supposed involvement in the deaths of the same two boys mentioned in regard to the More portrait above. http://www.holbeinartworks.org/efaqssevenkrichardiiitwentyone.htm you will come to a long article (some 70 pages in all) about Richard III. It details Richard’s activities from early on, for instance, when still Duke of Gloucester, he would not accept a French bribe. It dissects the likes of Commynes and Mancini, revealing how the use of invisible ink (probably lemon juice) added information for certain eyes only, almost like a 15th-century le Carré. And at the centre of it all is Richard, plotted against and lied about, his fault being to “underestimate his enemies and overestimate his friends”. His fate being to be innocent, yet “proven“ guilty by his self-interested foes, especially the French and Henry VII, often working in unison. “Apart from the Holbein allegations, you ask if “new” documentary evidence exonerates Richard III from the charge of having murdered Edward V and Richard, Duke of York. The short answer is ‘No’. However, if DNA findings are positive it means that new evidence can be added to old evidence that will exonerate Richard III for all time. In the event, we will request further instructions from the inquiry. For the present, we continue to test ALL evidence by NIET criteria. The aim and objective is to plan on paper and build on rock. Given the length and depth of all this, I trust you will forgive me for not attempting to go into great detail. This link gives more details concerning the NPG portrait, and in particular the configuration of Richard’s fingers and rings. I will not spoil it all by revealing too much here, but suggest that if you don’t know about all this already, then an hour or so spent delving through the articles will be rather rewarding. Even if you end up pooh-poohing the whole thing. Whether one believes such theories or not, unravelling them is fascinating, and always—always—there are some points that have enough ring of truth about them to get us wondering if there’s something in it after all. Please excuse the awful pun.